I've not heard anything by US black metal outfit Abigail Williams before. I let their metalcore-tinged past cloud my opinion of them and point-blank refused to listen to them for quite a while. For that I apologize. It seems that, thankfully, the trio has left the -core influences behind and taken a more orthodox symphonic black metal approach for this album. This is both the band's greatest strength and biggest downfall. This album perfectly produced and the musicianship is excellent. 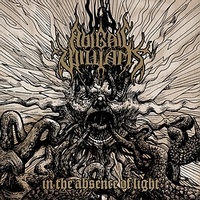 However, as enjoyable as In The Absence Of Light is it has to be said that it adds nothing new to the already bloated sub-genre of symphonic black metal. The band sounds like a Dimmu Borgir clone. Whilst I wouldn't say the songs are boring they do just miss that indefinable factor that makes them hold your interest. Its all too easy to zone out during a song and then not feel like you've missed anything when you zone back in again! This is an album that die-hard symphonic black metal fans will enjoy even though it doesn't add anything new. For the layman fans there are other albums out there that you should acquire before this one.